When you need to get IRP California plates quickly and have all your questions answered call the experts at Sky Transport Solutions. Sky Transport Solutions is authorized to issue plates, stickers, decals and cab-cards from our office. We work quickly and efficiently to make sure you are on the road hauling freight and in compliance with all laws. Send us your Telephone Number and we will contact you and explain all our services and answer any questions you may have regarding IRP CA plates, stickers, decals and cab cards. Truckers keep in mind the following. You need to keep records that reflect all activity of every apportioned vehicle, whether loaded, empty, bobtailed or deadhead. Also keep all fuel and distance records, including the source documents from the drivers and the monthly/quarterly/annual summaries by vehicle and fleet. See Section 1010 in the IRP Plan for a detailed list for both manual and electronic (GPS) records. IFTA details the requirements in P540 of the IFTA Procedures Manual. The key words here are: whether loaded, empty, bobtailed or deadhead. The staff here at Sky Transport Solutions will walk new truckers through the whole process that surrounds IFTA filing and IRP plates. Our goal is to provide you the support your trucking company needs to be legal and compliant on the road. Transporting freight is already a demanding job and we want you as the trucker to haul freight safely and efficiently and we will cover the paperwork, filing and permitting. 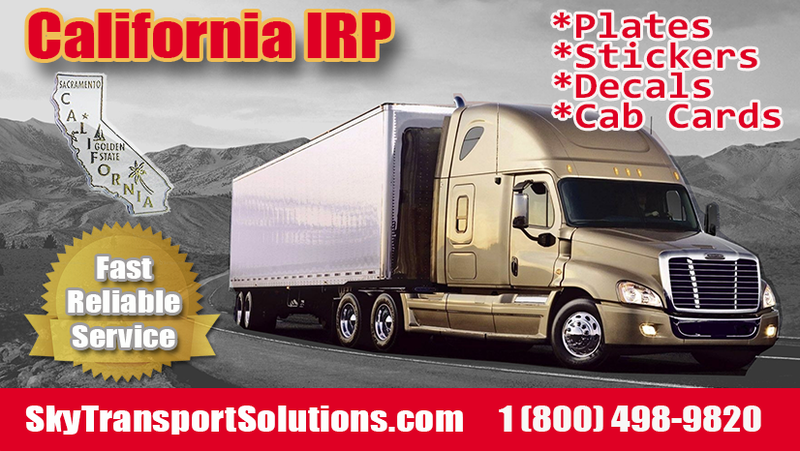 We make sure you get your IRP California stickers, decals and cab cards quickly. Like every other successful venture we all know that one person can not possibly do all the work themselves. What is important to you as the truck owner operator is that Sky Transport Solutions offer services that are reliable and very competitively priced. We always encourage you to do research on your own. However when you have questions we are here for you. California highways provide truckers the means to transport freight to warehouses, manufacturers and distribution centers. So check out whats the condition of major highways and roads in the state of California. Sky Transport Solutions (83172) IS LICENSED BY THE STATE OF CALIFORNIA, DEPARTMENT OF MOTOR VEHICLES (DMV). THIS SERVICE HAS NOT BEEN APPROVED OR ENDORSED BY ANY GOVERNMENTAL AGENCY, AND THIS OFFER IS NOT BEING MADE BY AN AGENCY OF THE GOVERNMENT. CALIFORNIA VEHICLE CODE (CVC) SECTION 1685. DOT Supervisor Training – see our new website!